I finished Braydon's "B" Sweater last night and Matilda the Bear agreed to model it even though she's not as big as he is. Pattern: The basic "Panda Pullover" pattern, page 59 in Maine Woods Woolies by Hélène Rush, was used as the template for this sweater. I charted the letter "B" and decided where to put the stripes on the sleeves. Notes: The sweater is for my grandson, Braydon. It was inspired by a sweater I made for his Mom when she was 3 years old. The pieces of Braydon's "B" sweater are finished and blocked and I'm now in the process of putting them together. It won't take long to knit the neckband, then I'll have another Finished Object to tell you about. The color is a bit off. 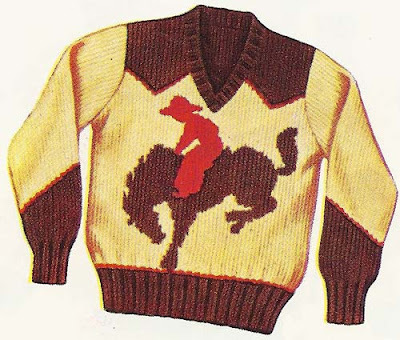 The sweater is closer to the color of a football. It's so much fun to knit for my Grandson! I wonder what I should make for him next (he's 14 months old). Here's something to think about: I'm going to run a contest this coming weekend and for a chance to win the prize, just tell me what you think I should make next, with a link to a pattern or a picture, if you have one. I'll post a picture of the prize when the contest opens and I think it's something that knitters will like, and probably don't already have! Intrigued? Come back with your best suggestion(s) on Sunday to find out more. By the way, the Cowboy sweater that I talked about before is something I'll be making soon, but the smallest size is 4, so I'm not going to start it right away. Maybe in a few months. Besides, I have another intarsia project currently on the needles. I think that winding yarns and weaving in ends is going to take more time than the actual knitting for the Triangle Squares Cushion. It's okay as I'm not in any hurry. The yarns on the right, the bottom 5, are for the black vertical lines between the squares. The larger one at the top is for one of the side borders. For the other side, I'll work directly from the ball. 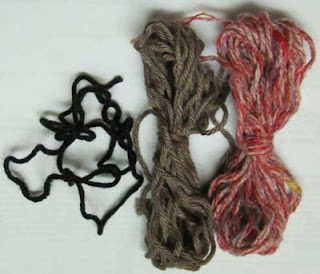 The small black yarn pieces on the left are for the centers of the squares. The bottom row of the colored yarn is for the bottom triangle, the top colors are for the top triangle. 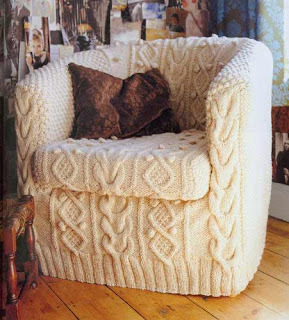 The aran slipcover must have taken hours and hours and hours to make, that is, after all the time it would have taken to design it so that it fit the chair just right.﻿ It must have been very heavy as the knitter approached the end of the project and started putting it together. With further exploring I found this whimsical kitchen clock. On the website where I found it, here: http://www.flickr.com/photos/31021769@N03/5556200378/, there was a comment that, if this had been an alarm clock, it could be a Strawberry Alarm Clock. Am I aging myself by remembering this group? So, for Music Monday, here's the Strawberry Alarm Clock's "Incense and Peppermints" The video is poor quality, but the song is groovy!! I admit it, I don't always do a gauge swatch. I normally skip this step for shawls, afghans or baby clothes where a specific size isn't critical. As long as I like the fabric that I'm knitting, I'm fine with being swatchless. 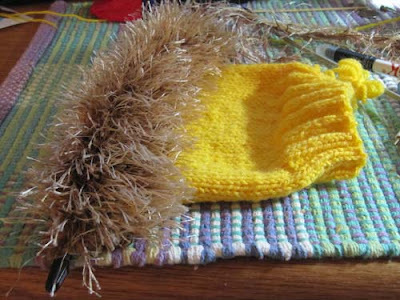 ► I didn't like the loose fabric I was creating, and the point where the yarns crossed was not a smooth, tight transition. ► On measuring, I was not making gauge, which explains the loose fabric. I knit another swatch on smaller needles, 3.00mm. The gauge is now correct and the block looks good to me. ► If I'd made the pillow at the looser gauge, I would have used more yarn. I'm sure that I have plenty, at either gauge, but why risk it? 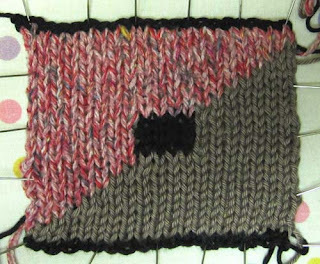 ► The intarsia is going to be fairly easy since the pattern is predictable. 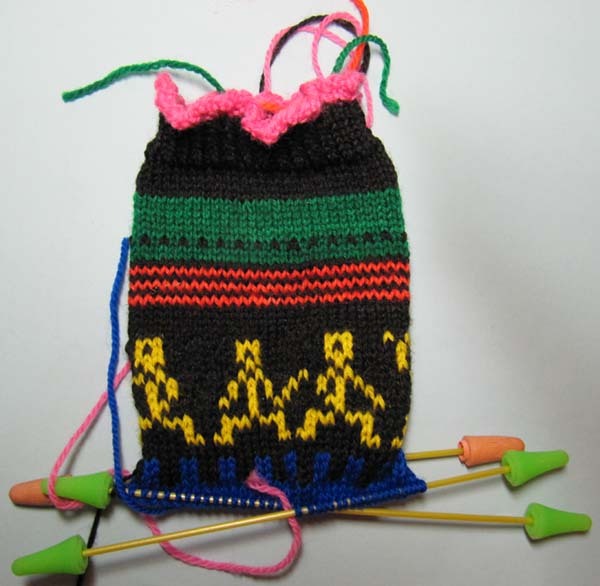 ► Based on this little bit of knitting, using new-to-me Revive. I'm finding that I like the yarn. It reminds me of some of Rowan's earlier, discontinued yarns, such as Silkstones (from the 1980s, I think). It has that slightly rough, organic feel. If I still like it after finishing this project, I have another sweater that I'd like to do (but as a woman's cardigan). But, that's for another time! The two main colors for each block uses 159" (13 feet, 3 inches) of yarn and the small black rectangle in the center uses 20" of yarn. 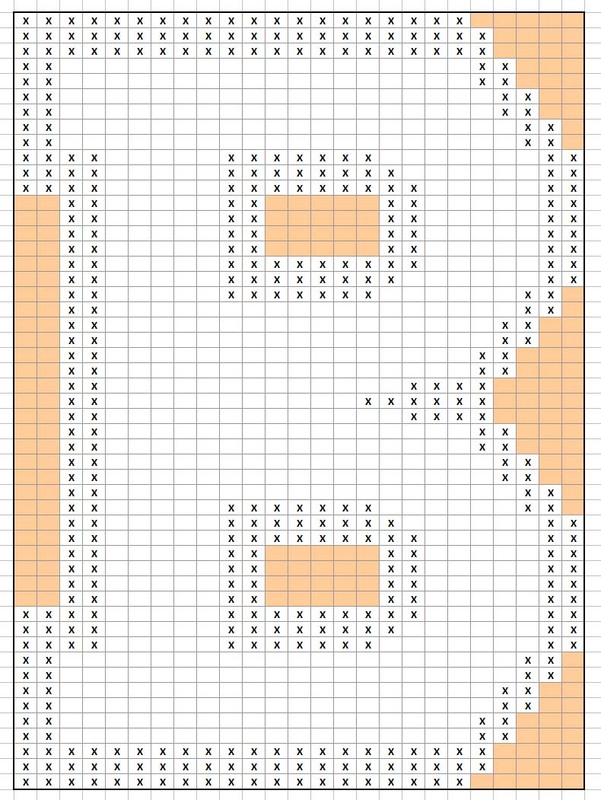 (1) In Excel I graphed one of the squares from the pattern chart. I tried to enlarge a square on the photocopier but it turned out blurry. 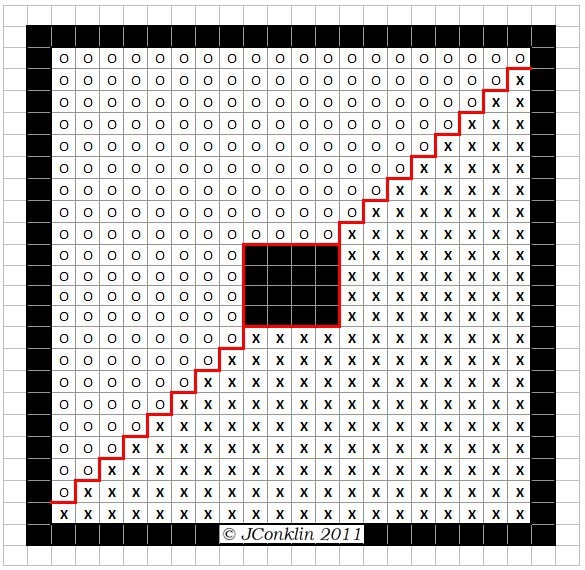 I only needed to chart one square as all 48 are the same, just the colors and yarns are different. (2) The pattern is very small and it's difficult to tell what yarns to use, so I made an enlarged chart in Word. It's fine that the knitting is a challenge. I don't need the pattern to be one. 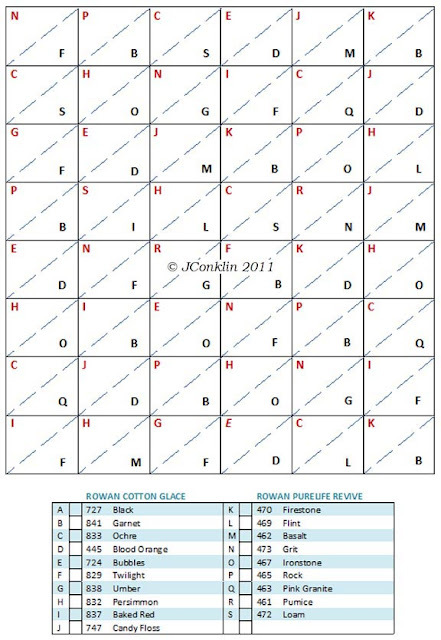 At the bottom of the chart I listed the 19 yarns. When I print this page, I'll draw in the symbols by hand. ﻿If you decide to make this cushion, you're welcome to print out these pages for your own use only. If you put them on your blog, please let me know and give credit and a link back here. Thanks! (3) I've taken a file card and punched holes in it. 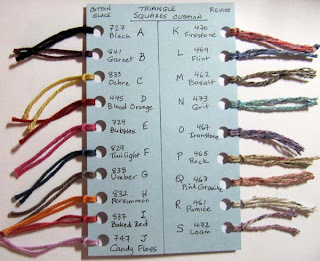 I'll make my own color card, adding snippets of the yarns. (4) I'm going to start with making just one block to test the gauge. When it's finished, I plan to rip it out and measure the lengths of yarn. Then, I can cut pieces of yarn for each of the blocks, except for the black borders. This will make the tangling easier to deal with. Each piece can be pulled free from the other yarns when I get to it. 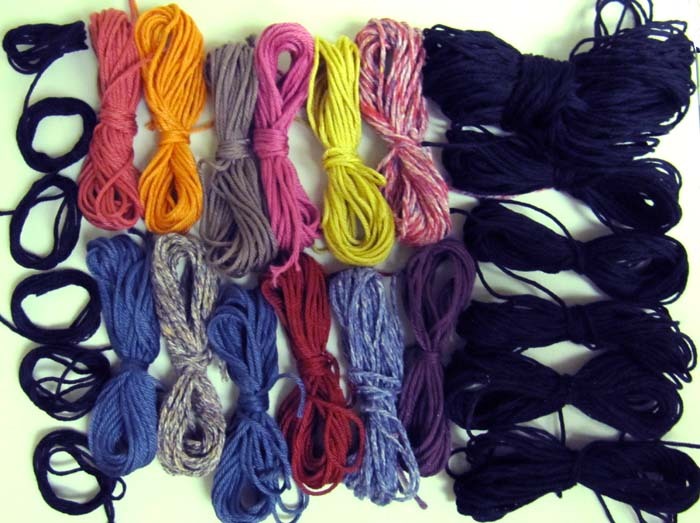 I don't plan to use bobbins, except perhaps for the black outside borders. All this planning will make the actual knitting easier, faster and less stressful. While I've been doing these preparations, the pieces of Braydon's 'B' sweater are blocked and drying. I'll be sewing them together this weekend and then will start the neckband. The yarns for the Triangle Squares Cushion by Kaffe Fassett are Rowan Cotton Glace and Rowan Purelife Revive. Both are a DK weight. The design is the same on both sides of the cushion. 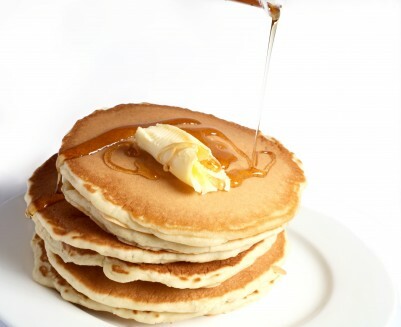 How tempting it is to do something totally different on the reverse. I'm looking forward to knitting with Revive for the first time. I'm looking forward to the weekend, but I doubt I'll be taking this with me to get the oil changed in my car. It's not a very portable project! 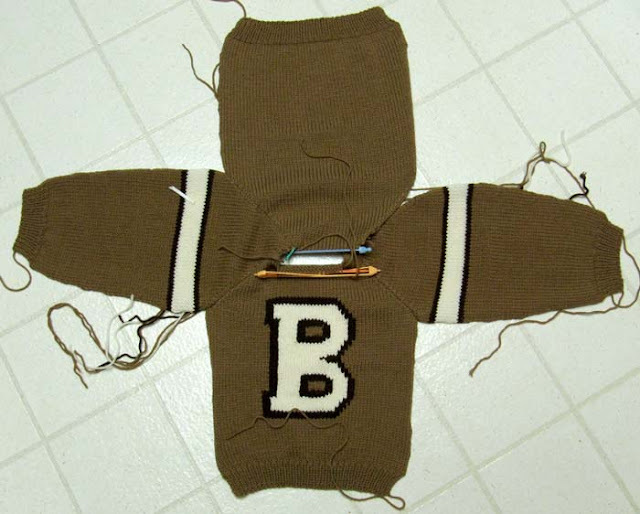 Braydon's "B" Pullover is coming along quickly. The back and both sleeves are finished and are blocking right now. I changed my mind on making it a modified drop-sleeve pullover, opting instead for raglan sleeves. I had completed the back and had to rip out to the beginning of the armhole shaping. I can't say that I minded. Ripping back in knitting doesn't rip my heart out! I just want to have a finished sweater that I like. I made the decision as I was about to start the shaping on the sleeves, so there was no need to rip back on those. 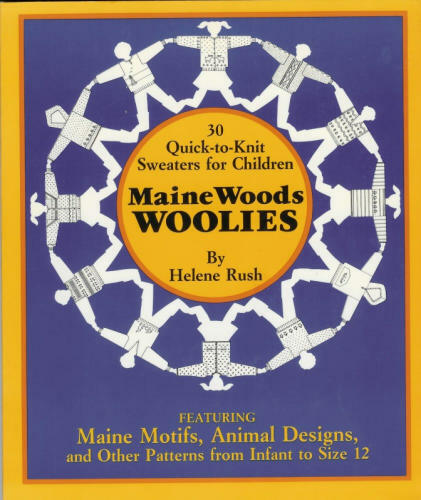 Instead of following the instructions for the Penguin sweater in Maine Woods Woolies, I'm now using the Panda sweater on page 59 as a template. 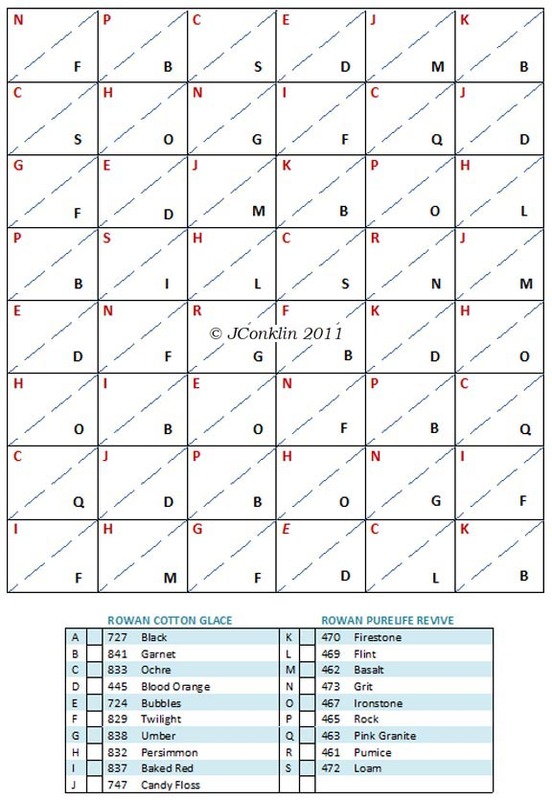 I won't, however, be making the neck placket. 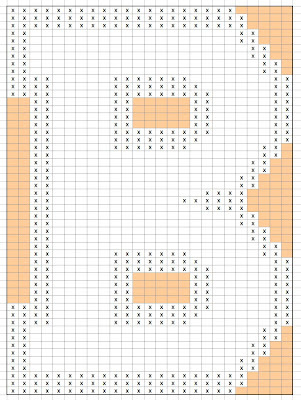 The letter B is charted (in Excel) and ready to go. I cast on last night and got the ribbing and a few rows of stocking stitch completed. Tonight I'll be starting on the intarsia. With winter now behind us, I thought I'd celebrate the past season with a video that I found on "Diana Natters On". It's set in Montreal and is a love song. If you go to the You Tube link, a translation has been posted. 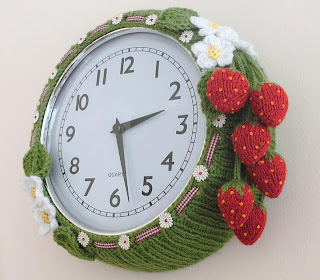 Someone has put a lot of time, thought and machine-knitting into this. 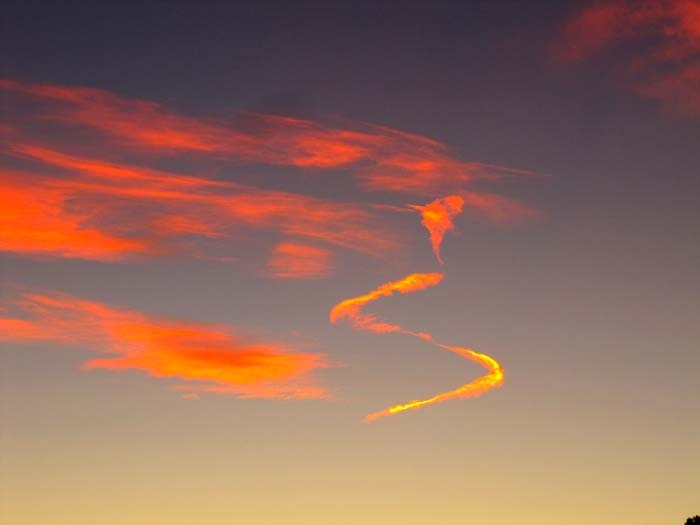 Enjoy and be amazed. As I posted yesterday, I'm going to make a pullover for Braydon with the letter "B" on the front. I have the yarn, Berocco Pure Merino DK, which is now discontinued. 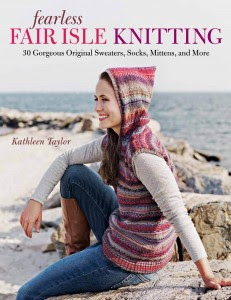 I can't imagine why they would discontinue such a nice yarn. Obviously the company didn't ask me for my opinion. ﻿Rather than design a plain, modified drop shoulder sweater on which to knit the "B" motif I'm going to use a pattern from a book I haven't used in about 25 years, "Maine Woods Woolies" by Hélène Rush. Browsing through the book has brought back memories. For example, next to the pattern of the Aran Pullover (page 33) and the Sampler Pullover (page 64) I wrote "GOOD", meaning that it was a good pattern, clear and well-written and that the sweater turn out as planned, and there are yarn labels stapled to the pages. 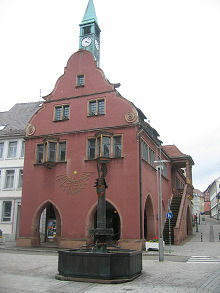 I was also reminded that there was no yarn store in the town where I lived and I bought my yarn at Woolworth's. The yarn really wasn't too bad for children's clothing. For the Aran I used "Paton's Parade", which I'm betting has long been discontinued. For the Sampler sweater there are two labels, so I must have made it twice, once with Picasso by Argyll DK and once with Jessan Malibu. The price tag is still on the Malibu label. It was 75 cents, marked down from $1.00 for a 50g ball. This time, I'm following the instructions given for the Penguin Pullover on page 57. I've started knitting the back of the sweater and later today I'll take out some knitter's graph paper and work on designing the letter "B" for the front. Once upon a time there was a young girl named Jessica. 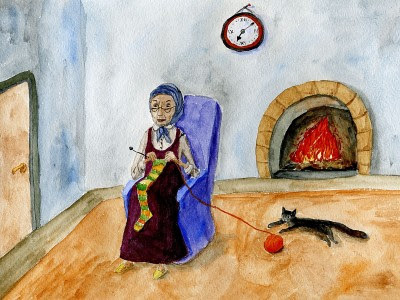 She loved all of the sweaters that her mother made for her and there were many, as her mother loved to knit. 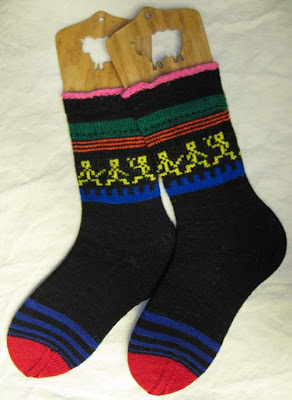 She knitted sweaters with animals, cartoon characters, piano keys, cables, textures and lots of colors. 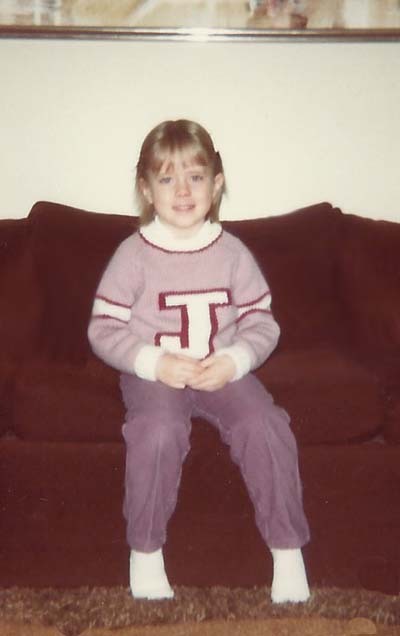 One day she gave Jessica a sweater with a big letter 'J' on the front. Jessica loved it and wore it often. The years went by, too quickly it seems, and Jessica grew up. She became a mother to an adorable little boy named Braydon. 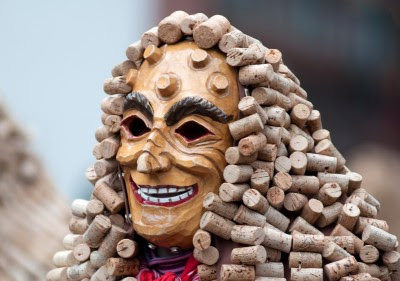 "Ah ha", said her mother, "I'm a grandmother now and I'm going to knit for my grandson." She knit a sweater with a Smurf and another with stripes. Then she thought to herself, "I must make a sweater like the one I made for Jessica, but with a big letter 'B' on the front." One day Grandma was at her local yarn store, knitting with a nice group of ladies on a Friday night. She decided to look in the half-price sale bin and there it was, the perfect yarn for the 'B' sweater. 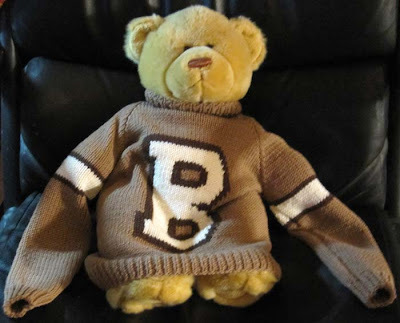 It was a very nice yarn, sadly discontinued by the yarn company, and there was enough for a sweater for Braydon. 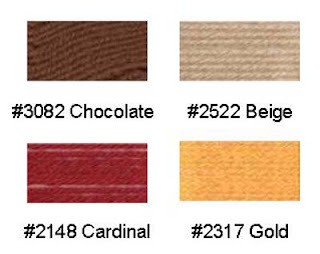 There were two colors of brown and she bought some of the lighter brown color and a ball of the dark brown color. Grandma also had an almost-white color in her own little yarn store at home. She calls that her "stash". So now, grandma is knitting the sweater for Braydon and she hopes that he will like it. Well, this story is at an end, but the knitting is now underway. Details tomorrow. My Mother's side of the family is Irish, emigrating to Canada during the potato famine in the early 1840s. 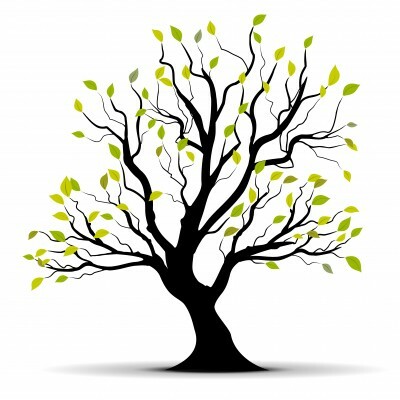 She has done an amazing job of tracing the family tree, along with photos. It's been very interesting to "meet" my ancestors. Her family's name is Donnelly, and we always celebrated St. Patrick's Day in our house. There will be Irish stew on the table at dinnertime today. 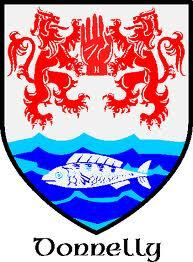 Many of my ancestors lived in the town of Portadown, County Armagh, Northern Ireland. 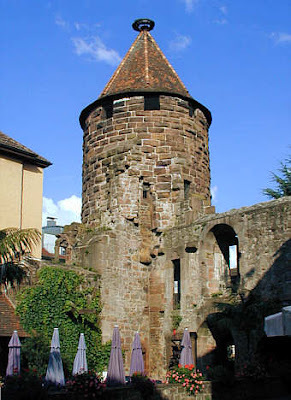 It was very special to visit it several years ago and the people I met were warm and friendly. Well, you can't have Irish roots and not knit yourself a special Irish sweater. I've made a few in the past and gave away all but one. It was a British pattern in Canadian yarn. But, I need something more authentic, so I bought the Donnelly aran from the Clanarans website, based in Killarney, County Kerry. It's been in my stash for a while, but it hasn't been forgotten. 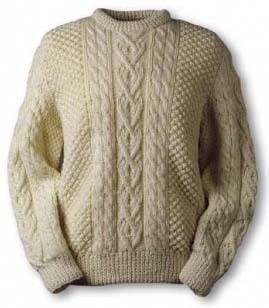 I also have the Armagh sweater by Alice Starmore from the Celtic Collection book on my wish list, but I must finish more projects before I can consider it. If you love birds and nature then you might want to check out the hummingbirds. The link is here (there is a commercial before you can see the birds). 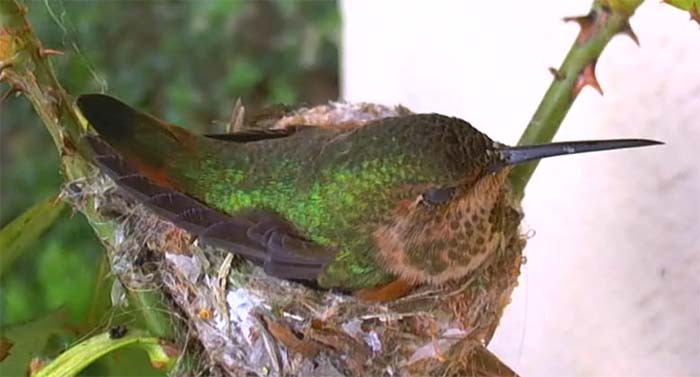 Mama Hummingbird is named Phoebe and her two little eggs hatched this past weekend. Watching them on a monitor, it's easy to forget just how tiny they are. I like to check in every day to watch as the babies grow, learn to fly and eventually leave the nest. Right now they don't have their eyes open yet, and they are hungry little ones. 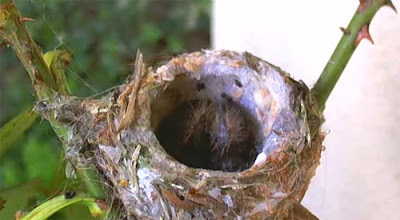 The nest is in a rose bush by a house in Southern California. 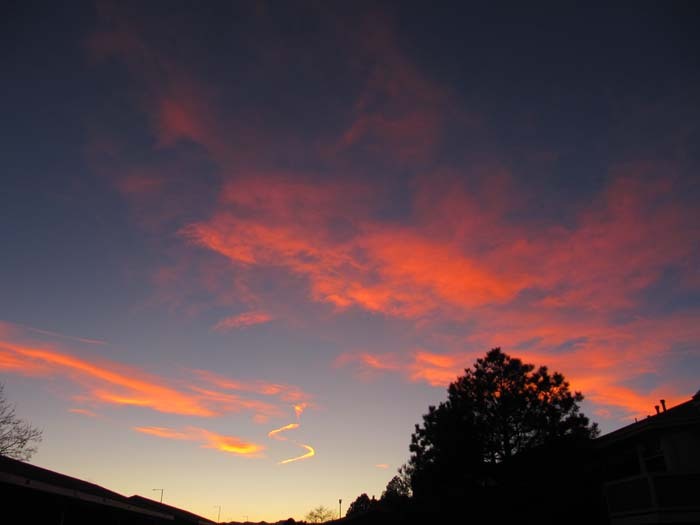 What a treat it is that the home owner shares this experience with us by setting up a camera. 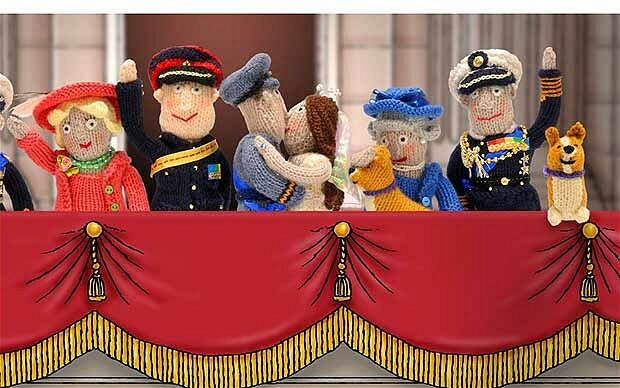 Update: Check out the video, featuring the knitted Royal Family on YouTube. 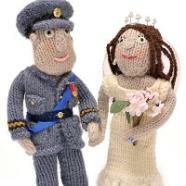 With all the talk about the upcoming Royal wedding I shouldn't be surprised that there is a Royal wedding knitting book due out at any time now. The characters are amazingly realistic. The Queen looks like...well, the Queen. And, Prince Philip is fully decked out in his military uniform. Camilla tries to outshine the bride and groom, dressed in red. Even the Queen's corgis are part of the festivities. (L-R) Prince Charles (not shown), Camilla, Prince Harry, Prince William, Kate, Queen Elizabeth, Prince Philip, and the Royal corgis. ﻿So, did I buy a copy of the pattern book? I couldn't resist. 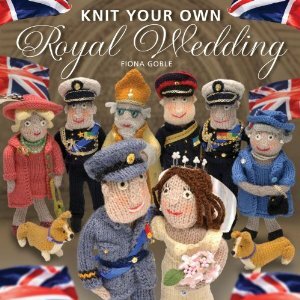 The book is "Knit Your Own Royal Wedding" by Fiona Goble, available here. Someday I'll post about another Royal book in my library, "Royal Knits" in case you want to make a little something for yourself? With St. Paddy's Day coming up in a few days, I thought it would be fun to hear Irish band, Thin Lizzy. This song still sounds good thirty-eight years later. Thirty-eight years? Where has the time gone? My Mullet socks are finished and ready for business or for a party. The yarn is beautifully soft and the colors are strong. It was a pleasure to knit with it. Cuff: Cast on twice as many stitches as needed, first row: k2tog across to create a small ruffle. Double pointed except for the dancers which were done in fairisle with 12" circulars. Notes: (1) The name of the socks comes from the phrase when talking about a Mullet haircut: “business in the front, party in the back”. These socks are “business” if you wear them with slacks as what you’ll see is plain black. However, when you’re ready to party, roll up your pants’ cuffs and kick off your shoes and the socks become “party”. (2) For the Friends of Cabin Cove group on Ravelry, click here. 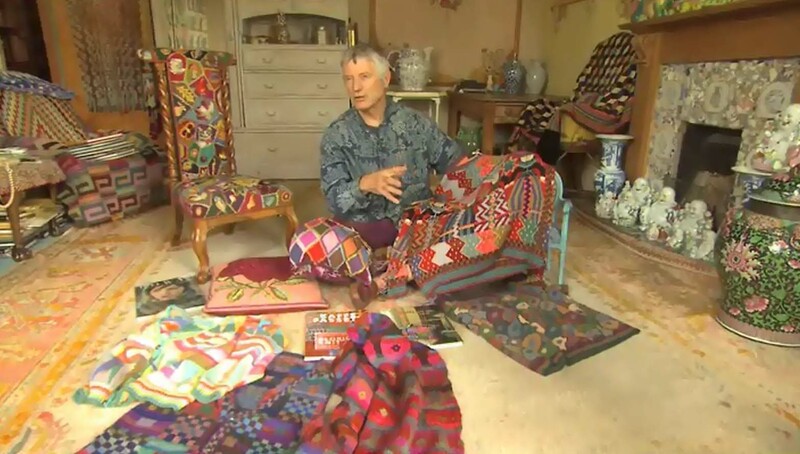 Does anyone remember the Knit O Graf patterns? They were published in the 1950s, and, I think, also in the 1960s. 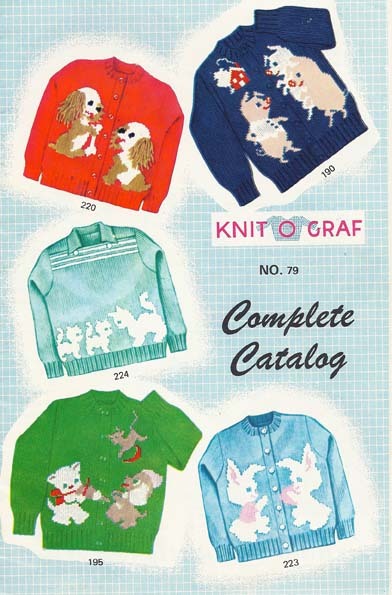 I really these old patterns and they are part of the reason that I grew to love intarsia knitting . I made several of the designs for my daughter and her friends when they were little: Humpty Dumpty, Train, ﻿Ducks and Clowns among them. 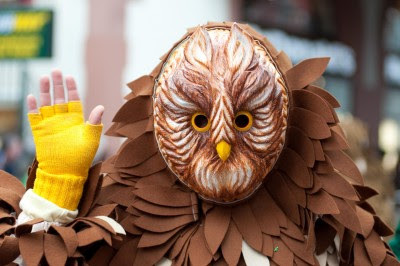 It was fun, and the kids loved them. One of the things that I really liked about these particular patterns was the fact that the knitting graph was life-size. 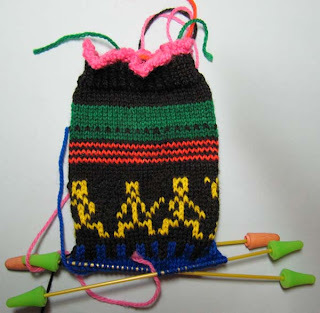 You could lay your knitting on top of it to be sure that your sweater was the same size as the one in the pattern. It was also nice to have the intarsia graph so large. Nowadays, I'd take it to a copy place and have it enlarged, but I don't remember that being an option "way back when". I treasure these old patterns and wouldn't part with them for the world. I won't make copies for anyone, but I have seen some of them on eBay. I have an address for the company, if you're interested, but I have no idea if it's a good one as it's on the back of the catalog (above), which is probably 40 years old: Knit-O-Graf Pattern Co., 958 Redwood Drive, Apple Valley, MN 55124. 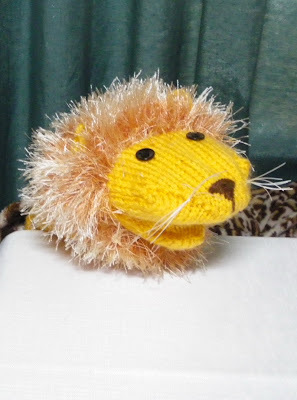 Here's the link for those of you who wanted to buy the lion puppet pattern: Audrey's Knits. 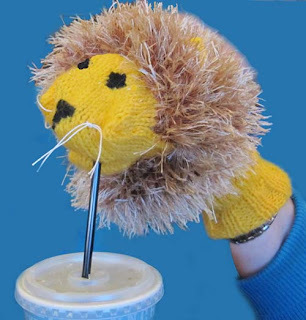 The pattern contains directions for making 4 different puppets. I'm currently working on two projects that are predominantly black. The second Mullet sock is on the home stretch and should be finished in a couple of days. It's all in black from here on until I get almost to the toe. There is a brand new Ravelry group, click here, in support of Cabin Cove's yarn. You're invited to join us. 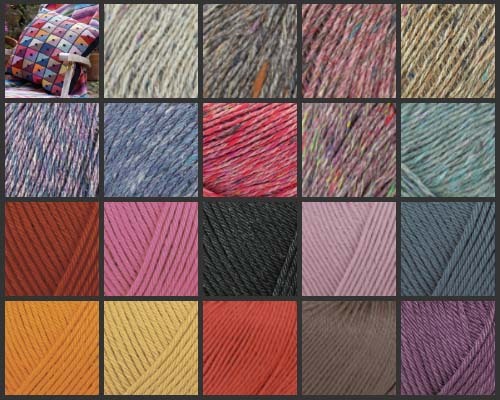 And, currently at the top of my queue is my Bohus, The Large Lace Collar pullover (second row of photos, left side). The multi-colored yoke is finished and it's all black knitting all the time from here to the end. I'll be ready for plenty of color after these two projects. There will be more FOs before long!! Braydon's hand puppet is finished and my test-knitting notes have been emailed to the designer. It's a good pattern and was a fun, whimsical knitting project. What an awful picture, below. Trying to take a picture of a puppet which is on your hand is almost impossible, for me, at least. I laid the puppet down and took this picture, but you can't see its lower jaw. This one will do until I can take a better one in a few days. Since adding this picture I realize that I forgot the whiskers. I'll add them for the next, hopefully better, photo. Pattern: Contact Audrey knits. I'll post the details when I know them. Notes: (1) ** Fun Fur and Foxy are pretty-much identical/interchangeable. Two shades were used for depth of color, but you could use two strands of one color, thus saving the cost of a second ball of novelty yarn. On Saturday, 3/5/11, Fun Fur was on sale at Joann's for $2.50/ball. This is the same yarn that's used for the beards of Alan Dart's gnomes, by the way. I picked up a pretty copper color in order to make an Irish leprechaun from the gnome pattern someday, if I ever get caught up! (2) As Braydon is just over a year old I embroidered the eyes rather than sewing on buttons. The buttons would have been much easier since they already look alike. I did the eyes a couple of times in order to try to make them match as closely as possible. 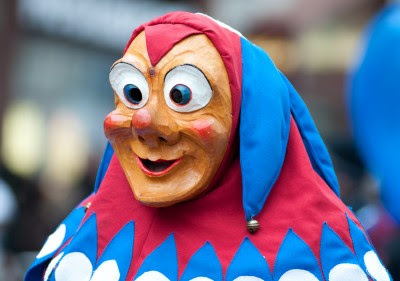 I would have preferred to make the eyes and nose dark brown, but couldn't find that color in my stash, so black it is! (3) The pattern includes designs for a dog, dinosaur and a rabbit along with the lion. This weekend I am test-knitting a lion hand puppet for Audrey Knits. So far I'm finding the pattern directions to be very clear, plus all the photographs help a knitter to know exactly what they are to do. ﻿I decided to try a different method and it worked, too. 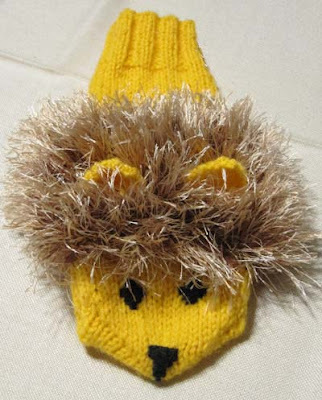 I finished knitting the yellow cuff and knit the first row of the mane, as in the pattern, with the right side facing. Again, it means that the long eyelashes were on the inside, but for one row, it's okay. I did this because I wanted this row of two-colored stitches (yellow plus the eyelash) to be on the inside. Then, instead of continuing in stocking stitch, I switched to reverse stocking stitch, starting with a knit row on the reverse side. 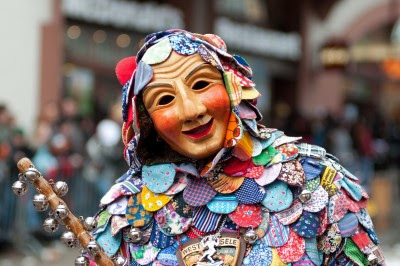 What this did was to make the long hairs lie on the outside of the puppet. Confusing? It really isn't difficult. I just changed from stocking stitch to reverse stocking stitch. As you can see, I won't need to brush the yarn to bring the strands to the outside. They are already there. The mane is really thick, hopefully not too thick, and I think it's going to be fine. Next up was the short row shaping for the jaw. If you ever want to reinforce your short row knitting skills to the point where you can do them mindlessly, make a Lizard Ridge afghan. I made one full afghan (Ravelry link) and 3/4 of a second one. By then, I decided to move on to other projects and gave away the squares to a friend who is going to finish it up for herself. I'm looking forward to seeing it. I've had some enquiries about where to get the pattern and I'll post a link when Audrey gives me the details.